Looking for more? | Food It Yourself! I hope you are enjoying this blog, and that you are now inspired to get in touch with your food. I understand, however, that this blog cannot be all things to all people. The good news is there are many food and nutrition blogs out there. The bad news is there are many truly awful food and nutrition blogs out there. You could spend days sorting the wheat from the chaff . However, you don’t have to. Here are some informative, credible blogs which I recommend. All are awesome. Check them out! Bored with your current menu rotation? Home Grown Nutrition is a blog that describes in detail how to grow things, why these things are healthy, and how you can make delicious things with them. Add some new flavors to your DIYet. On a super tight budget at the grocery store? Advice of a Thrifty Foodie offers advice for getting the most out of the food supply for the least amount of money. You can eat healthy on any budget. Are you in a difficult relationship with food? A Butterfly She Became is a place for support and information about developing a friendship with what goes on your plate. Worth a look by everyone. Are you living the gluten free life? All Things Gluten-Free can show you how to make it healthy and tasty. You can have a gluten-free DIYet! Disenchanted with megamart produce? Around the World in 100 Miles is an amazing blog about being a locavore- growing, gathering, and buying edibles as close to home as possible. With photos, recipes, and even a television broadcast. Did I miss anyone? Is there a terrific food, cooking, nutrition, gardening, grocery planning, pantry organizing, or special diet teaching blog you know of that I don’t? Tell us all by leaving a comment. 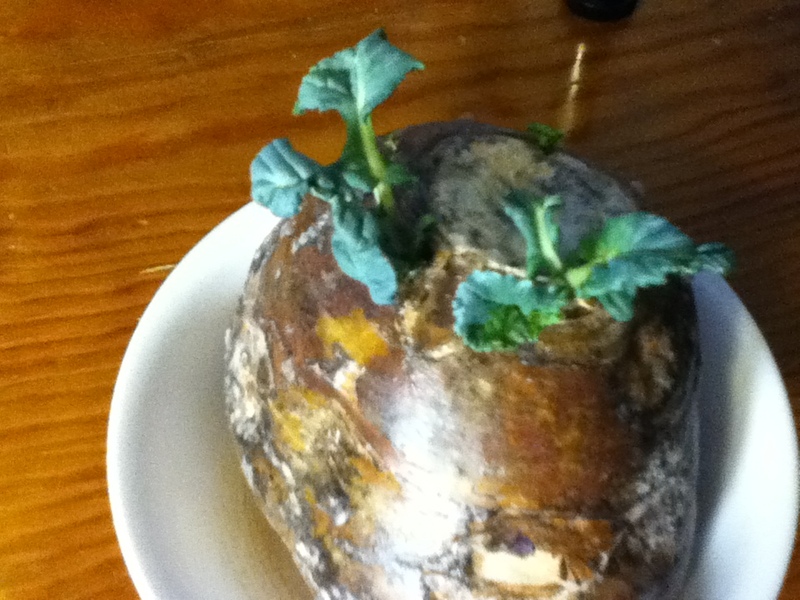 This turnip was forgotten at the back of my pantry. Now it is a houseplant. Just wanted to share.